How are food grade pellets different than heat pellets? Food Grade Pellets-How are they different? We always tell you to use 100% food-grade pellets in your pellet grills and smokers, but why? Food grade pellets will contain less fillers and will have less moisture content and ash than pellets used in wood burning stoves and furnaces. 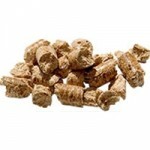 Pellets used for stoves and furnaces will also sometimes contain glue or something to bind the pellets together. Food grade pellets will use the lignin (natural complex polymer) in the wood instead. Glue will cause your pellet grill to back up and could possibly damage your auger. Pellets are relatively inexpensive and easy to store. They normally come in 20-40 lb bags. As long as they do not get wet, they will stay usable. You might be able to find pellets at local hardware stores, but always make sure you are looking for the food grade logo!